Dr. André Koelewijn presently works as a specialist on research and development at the department of Dike Technology of Deltares. He has about 20 years of experience in national and international geotechnical projects, with a focus on failure mechanisms of dams, dikes and levees. He has a broad experience on small-scale and full-scale failure tests, crisis management to avoid real dike failures, monitoring equipment and the incorporation of monitoring data into models and guidelines, development of models and software. He has been responsible for the geotechnical design and the execution of all field experiments of the IJkdijk. He has been the initiator of several international cooperation networks with France, UK, USA and China, and was involved in various research projects for the European Union. He has written over fifty scientific papers. In 2013, he received the Dutch Keverling Buisman prize for the best geotechnical paper. In connection to the new approach to dike safety assessments for the Netherlands, effective from 2017, a suitable set of dike design instruments needs to be developed and applied to dike improvement works to be carried out after 2016. A first test on full scale to create flow slides, without scale effects as present in laboratory tests in large and smaller flumes. This test was executed alongside a sand bar in the Western Scheldt, close to the shipping lane, employing three vessels with multibeam and other measurement techniques. Five smaller flow slides occurred during the ten days of the test. The Urban Flood project is part of the ICT-programme of the EU funded 7th framework programme, demonstrating the possibilities of ICT ‘from sensor to end user’. The sensors were placed in levees in Amsterdam, Emmerich (Germany) and Boston (England), this had to be done at the right positions in order to obtain meaningful data. Advisor R&D Dike Technology, quality control. Following the IJkdijk tests (see below), the applicability of sensor technology is tested on real, ‘live’ levees. This is done on locations in the Netherlands and abroad. In a consortium comprising a multitude of parties, including landscape architects and a sociologist, feasible alternatives for levee improvement were invented for three locations. At the Streefkerk location this alternative has been inserted in the on-going selection procedure. It is under construction since 2014. Advisor R&D Dike Technology, coordination of all matters related to geotechnics, design, construction and execution of wave overtopping test levee, review of design of levee stability test, execution of levee stability test, design and execution of piping (underseepage) failure tests, design and execution of a multi-failure mode experiment (executed in 2012). The IJkdijk (‘Calibration levee’) is an international collaboration platform for testing new sensor technologies on both full scale levees tested to failure and ‘live’ levees. Initiator, innovator and project leader. The GeoBrain development aims at the incorporation of practical experience in geotechnical design, which may be achieved by use of artificial intelligence techniques and visualisation methods to extract and present otherwise inaccessable geotechnical information. Pilot projects related to flood embankments, soil remediation and foundation engineering. Design, execution, analysis and evaluation of a full scale field test at Bergambacht (near Rotterdam): uplift-induced stability failure of an eight centuries old river embankment. Assistant, project leader, advisor, supervisor, auditor. Stability, seepage and settlement calculations for design, evaluation and reinforcement of various larger and smaller levees and (rail)road embankments on soft deposits in the Netherlands. A.R. 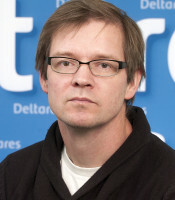 Koelewijn (2001), Ph.D. thesis, TU Delft. ISBN 90-9014355-6. André R. Koelewijn (2002), In: ‘Learned and Applied – Soil Mechanics out of Delft’, Frans B.J. Barends & Paola M.P.C. Steijger (eds), pp. 107-114. Lisse: Balkema. A.R. Koelewijn & M.A. Van (2003), Proc. 13th European Conference on Soil Mechanics and Geotechnical Engineering, Prague, August, Volume 1, pp. 755-760. M.A. Van, A.R. Koelewijn & F.B.J. Barends (2005), Int. J. Geomechanics 5(2):98-106. André R. Koelewijn (2007), Proc. 10th International Symposium on Numerical Models in Geomechanics – NUMOG X, G.N. Pande & S. Pietruszczak (eds), Rhodes, April, pp. 659-664. London: Taylor & Francis. André R. Koelewijn & Micheline W.A. Hounjet (2007), Proc. 14th European Conference on Soil Mechanics and Geotechnical Engineering, V. Cuéllar et al. (eds), Madrid, September, pp. 845-849. Rotterdam: Millpress. A.R. Koelewijn & A.M.J. Mens (2008), 6th Int. Conf. on Case Histories in Geotechnical Engineering, Arlington, August, 6 pp. Rolla: Missouri University of Science and Technology. V. Bennett, T. Abdoun, M. Zeghal, A. Koelewijn, M. Barendse & R. Dobry (2011), Advances in Civil Engineering, volume 2011, article ID 870383, 12 pp. Hindawi Publishing. C. Zwanenburg, E.J. den Haan, G.A.M. Kruse & A.R. Koelewijn (2012), ‘’, Géotechnique 62(6):479-490. London: Institute of Civil Engineers. A.R. Koelewijn, G. de Vries & H. van Lottum (2013), Proceedings of the 18th International Conference on Soil Mechanics and Geotechnical Engineering, Paris, 2-6 September, pp. 931-934. A.R. Koelewijn, G. de Vries, H. van Lottum, U. Förster, V.M. van Beek & A. Bezuijen (2014), 8th International Conference on Physical modelling in Geotechnics, Perth, 14-17 January, pp. 891-897, CRC Press. J.B. Rittgers, A. Revil, T. Planes, M.A. Mooney & A.R. Koelewijn (2015), Geophysical Journal International 200(2):758-772. Oxford: Oxford University Press. Zeitabhängigkeit bei rückschreitender Erosion unterhalb von Deichen, 2015, André Koelewijn & Ulrich Förster, 38. Dresdner Wasserbaukolloquium, Dresden, 5-6 March, 10 pp. A.R. Koelewijn & F.P.W. van den Berg (2015), 16th European Conference on Soil Mechanics and Geotechnical Engineering, 13-17 September, Edinburgh, 6 pp.